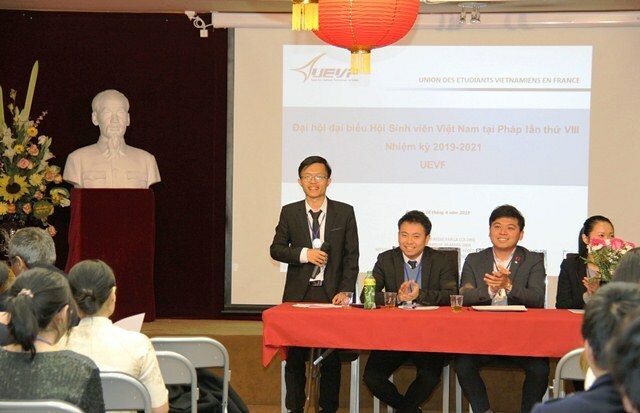 During the 2017-2019 tenure, the UEVF offered support to students, joined activities of the Vietnamese Embassy and preparations for visits by high-ranking Vietnamese leaders, including Party General Secretary Nguyen Phu Trong in March 2018 and National Assembly Chairwoman Nguyen Thi Kim Ngan in March 2019. It also popularised Vietnam’s land and people and historic periods in the process of safeguarding national sovereignty to French friends, as well as joined exchanges with Vietnamese students’ associations in Europe and raised 15,000 EUR (16,900 USD) for a rehabilitation centre in the central province of Ha Tinh in 2017. Doctor of aerospace science Nguyen Khanh Linh was elected as Chairman for the new tenure. Speaking at the event, Linh affirmed determination to work with the board and UEVF members to achieve set goals, including strengthening solidarity among chapters via cultural and sport activities, providing all possible support for students and looking towards the homeland.